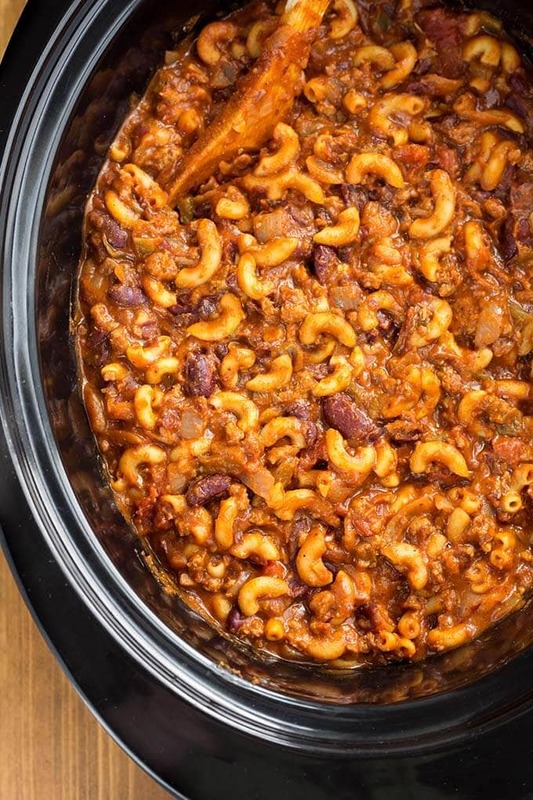 Slow Cooker Chili Mac is a dump and start crock pot recipe. Delicious chili with some pasta added at the end makes this a hearty, economical one-pot slow cooker meal. 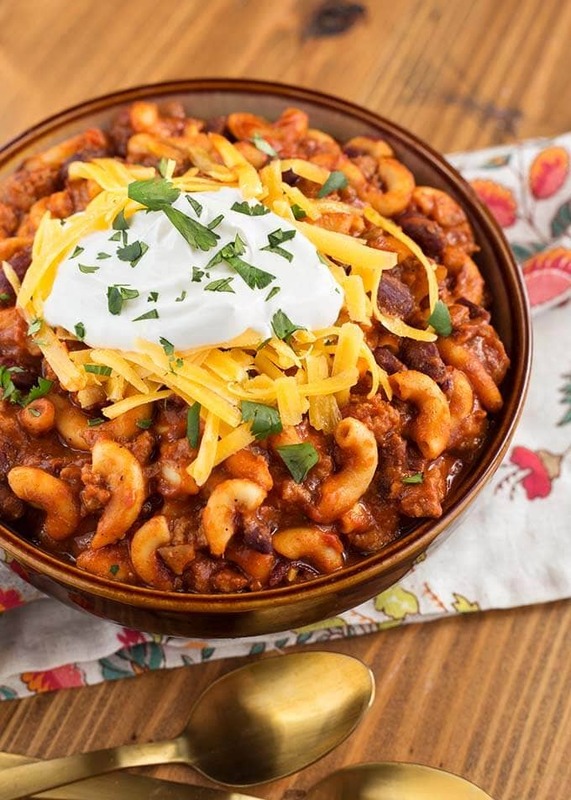 Enjoy this crock pot chili mac recipe on Game Day, or any time you want a bowl of comfort food. It’s chili. It’s macaroni. Together it becomes Chili Mac! We love this flavorful comfort food, with the hint of spice and a rich, yummy sauce. This is a very easy recipe to make. 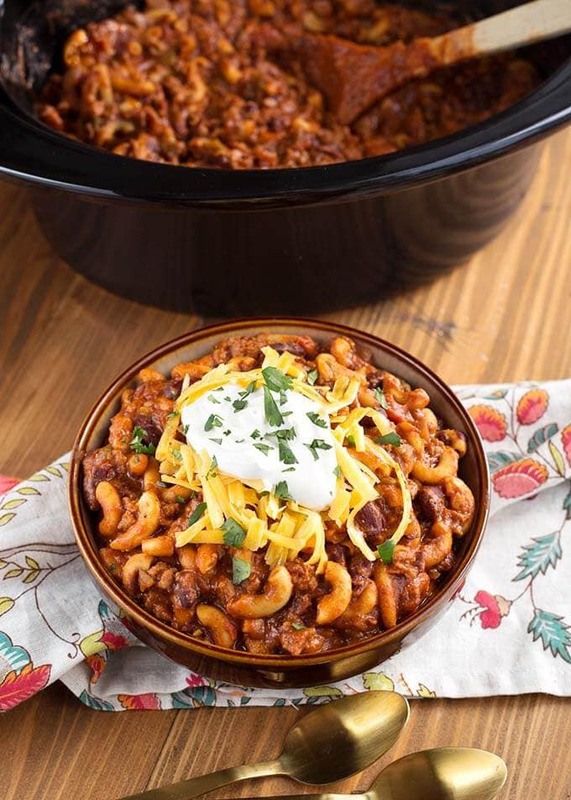 You don’t even have to cook the meat first, you can just put it in the crock and make your Slow Cooker Chili Mac! First of all, you may ask why don’t you need to cook the ground beef or turkey first. The meat will cook in the slow cooker with the other ingredients, and as long as you use extra lean meat, there is no extra fat to drain. Of course, you do get bonus flavor by browning the meat in a skillet with the onion and garlic & spices. However, if you want to get dinner in the crock and get going, don’t bother to brown it first. 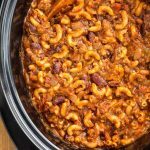 I have often made this Slow Cooker Chili Mac recipe with ground turkey, and it is still just as delicious. You can use chicken broth instead of beef when you use ground turkey, or still use the beef broth for its rich flavor. 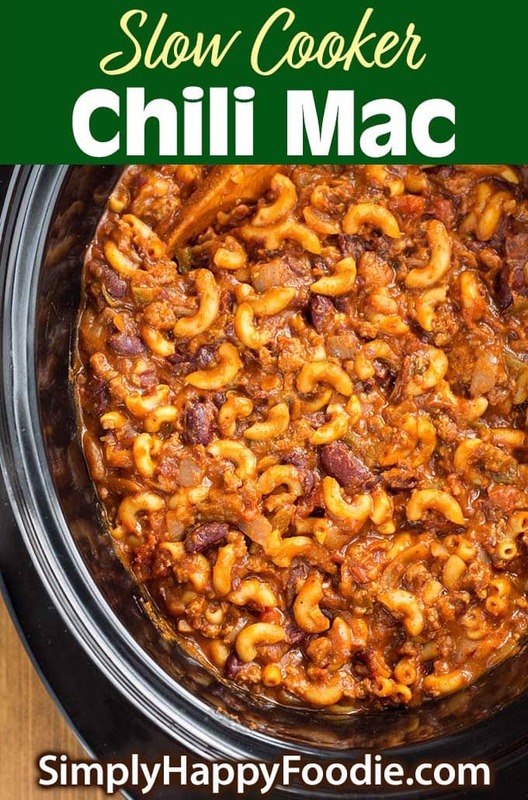 Part of the fun with this crock pot chili mac recipe is adding all of the yummy toppings to your serving! The possibilities are many! I have found that my favorite combo is cheese, sour cream, and cilantro. Keeping it simple and still so delicious! The pasta will cook in the sauce of the chili. Adding the pasta about 20 minutes before serving will ensure a nice al dente texture. Different pastas may vary. If you don’t want to add the pasta, you don’t have to. Just reduce the beef broth by about 1 cup. You can always add more at the end if it is too thick. 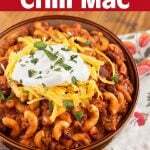 Slow Cooker Chili Mac is a dump and start crock pot recipe. Delicious chili with some pasta added at the end makes this a hearty, economical one-pot slow cooker meal. Add the meat, onion, garlic, bay leaf, chili powder, cumin, smoked paprika, oregano, salt, pepper, and cayenne pepper. Stir. Add the diced green chiles, diced tomatoes, beef broth, bouillon, beans, and tomato paste. Stir well. If you add the pasta dry, add it 20 minutes before serving and cook on Low. If adding cooked pasta, add just before serving. Taste and adjust salt, if needed. Garnish with your choice of sour cream, cheese, avocado, diced onion, corn chips, cilantro, etc. *If adding cooked pasta at the end, only add 2 cups of beef broth and add the third cup before serving, only if chili is too thick. Oh my gosh we loved this! My husband said to put it in the rotation!